The Educational Project of the tiger mosquito is one of the lines action of the Program for the Surveillance, Monitoring and Control of the tiger mosquito. It seeks to participate in the global struggle against the tiger mosquito to the students of primary schools in the Girona area. In the first, service technicians of Mosquito Control offers lectures/workshops to schools. Explain what is the tiger mosquito, which is its life cycle, which environments are more favorable for the development or how to avoid the duplication.In addition, they teach small to identify the larvae and adult specimens and what steps should be taken to prevent the proliferation of the insect. The second part is the field work. They are provided with a kit of entomologist to each student with all the necessary material to prepare samples and collect mosquito larvae by their usual environment. Teachers make reach the material to the Service, which analyzes the samples and the results are reported in each school. The data obtained also serve to extend the information that the service gets thanks to their regular checks. The main objective of the project is to raise awareness of the impact of the tiger mosquito on the health of the people and the natural environment, and give the tools to prevent reproduction. And that is that the educational activity in schools is linked to the adults. Boys and girls convey what they have learned to their parents and insist on the recommendations to prevent the tiger mosquito deposit their larvae. In addition, through the work of field, the adults participate in the collection of samples, in a way that raise awareness about the risks and prevention in the face this mosquito. This task of awareness is basic, it is estimated that if each person will be responsible for preventing the tiger mosquito breed at home, you will be reduced by 70% the survival of the insect. 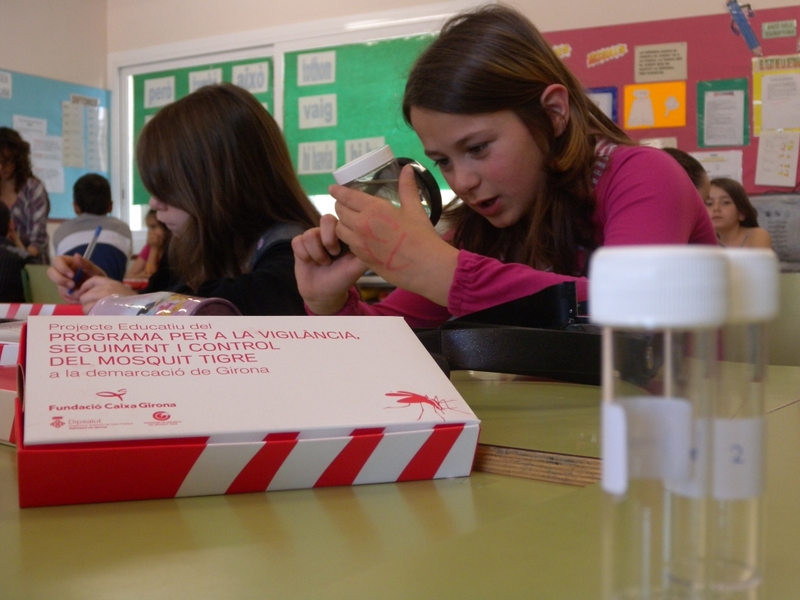 Since the first edition, the Educational Project of the tiger mosquito has been successfully implemented in all the province of Girona with a participation of 6,000 students for every edition. You can find information on tiger mosquito given to school children belonging to the educational project by clicking on the following image (optimized for Mozilla Firefox and Google Chrome). Copyright © 2019 Mosquit Tigre. All Rights Reserved.